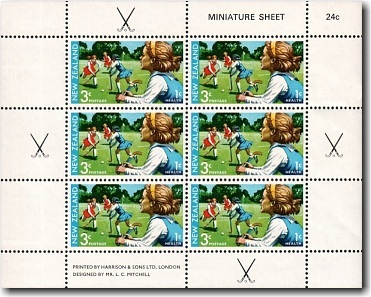 The sports theme was continued in the 1971 health stamps with Hockey chosen - the 10th International Federation of Women's Hockey Association's conference and tournament was hosted in New Zealand that year. A third stamp was added to commemorate the Golden Jubilee of the New Zealand School Dental Service. The New Zealand School Dental Service was the first of its kind in the world with Australia and Sweden later instigating similar programmes. Dental nurses were equipped to do simple operative dentistry including cavity preparation and fillings and 98% of school children used these free facilities. The service still operates today. 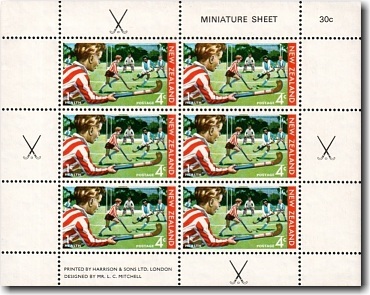 The three and four cent stamps were issued in miniature sheets and fewer than one half the number of five cent stamps were printed as five cents was not so common a postage rate.